A window near the door of the main ticket office on Yawkey Way was damaged and boarded up until it can be replaced. Who’s On First, a popular Fenway bar, was issued a licensed premise violation early Sunday morning after two women allegedly were shot by patrons leaving an event at the club, police said Monday. The two women, in their 20s, were leaving the bar about 2 a.m. Sunday when they said they heard gunshots. The shooter, or shooters, are believed to have been walking behind the women on Yawkey Way when the shots were fired, police said. Police have said they suspect the episode was gang related. The shootings rattled the area around Fenway Park as revelers were spilling out of the bustling bars and clubs. The Red Sox had played an afternoon game, finishing around 6:30 p.m., so most fans had long departed. Police would not specify why the bar was cited, but other Boston bars have been issued violations for overserving patrons, serving alcohol to minors, and for fights that occurred on the premises. Two women suffered non-life-threatening injuries, police said, adding that the incident may have been gang related. When bars are issued violations city workers can either schedule a hearing for the property in question or issue disciplinary action, according to the City of Boston website. The women lay bleeding on Yawkey Way, near Fenway Park, until police arrived, witnesses said. One woman was shot in the leg and the other in her side, police said. Both women, who have not been identified, were rushed to hospitals with injuries that were not believed to be life threatening. Officer Stephen McNulty, a Boston police spokesman, did not have an update on the women’s conditions Monday. 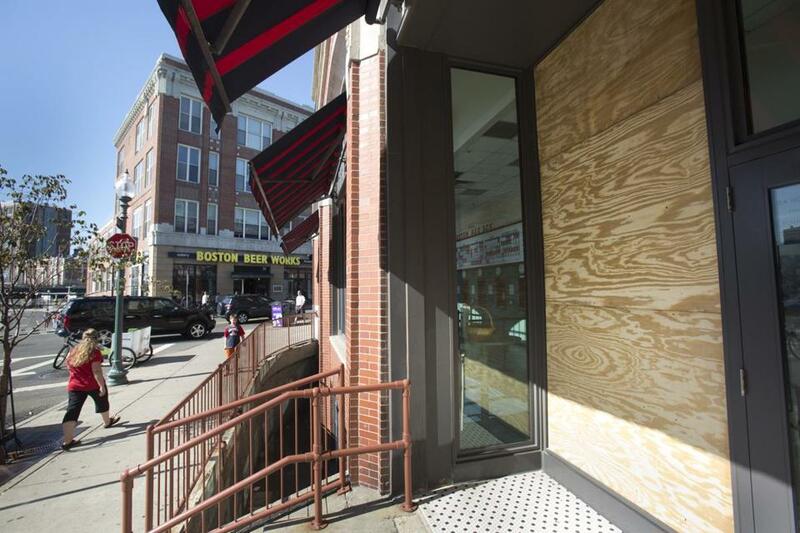 Additional bullets ricocheted, shattering the window at Boston Beer Works. One of the victims told responding officers she heard gunshots coming from near the entrance of Who’s on First. After speaking with bar workers, a police sergeant issued the licenced premise violation, McNulty said. Owners of the bar have declined to comment on the episode. A man who answered the phone Monday said, “We didn’t even know about the shooting until later in the day.” He did not provide his name.